The activity/exercise must be enjoyable enough that it doesn't take a massive application of willpower to make it happen. While selling health-related "miracle cures" of one kind or another is big business, the real "miracle cure" is activity/exercise. The essential role of exercise/fitness is backed up by a large and growing body of evidence. It's now apparent that humans are "born to walk" and need to stay active to be healthy: eating well isn't enough. If we apply the foundational processes of evolution to our own health, we end up focusing on the critical role of activity/exercise in our well-being--and in particular, the impressive benefits of walking. "Mounting scientific evidence shows that exercise is good not only for our bodies, but for our brains. Yet, exactly why physical activity benefits the brain is not well understood. Having this underlying understanding of the exercise-brain connection could help researchers come up with ways to enhance the benefits of exercise even further, and to develop effective interventions for age-related cognitive decline or even neurodegenerative diseases such as Alzheimer's." The link between brain health and exercise is visible in studies of dementia and Alzheimer's, which have found that a daily walk reduces the risk of developing these disorders. The other article worth reading is Humans Evolved to Exercise: (Scientific American) Unlike our ape cousins, humans require high levels of physical activity to be healthy-- "Exercise is not optional; it is essential." "Among our primate cousins, we humans are clearly the odd ape out. Somehow humans evolved to require much higher levels of physical activity for our bodies to function normally. In ecology and evolution, diet is destiny. The foods animals eat do not just shape their teeth and guts but their entire physiology and way of living. Species evolved to eat foods that are abundant and stationary need not roam too far or be too clever to fill up; grass does not hide or run away. Moreover, hunting and gathering required hominins to work harder for their food. Simply moving up the food chain means food is harder to find; there are a lot more plant calories on the landscape than animal calories. Hunter-gatherers are remarkably active, typically covering nine to 14 kilometers a day on foot—about 12,000 to 18,000 steps. Although we have long known that exercise is good for us humans, we are only beginning to appreciate the myriad ways our physiology has adapted to the physically active way of life that hunting and gathering demands. Nearly every organ system is implicated, down to the cellular level. Some of the most exciting work in this area has focused on the brain. Raichlen and his colleagues have shown that our brain has evolved to reward prolonged physical activity, producing endocannabinoids—the so-called runner’s high—in response to aerobic exercise such as jogging. Raichlen and others have even argued that exercise helped to enable the massive expansion of the human brain and that we have evolved to require physical activity for normal brain development. Exercise causes the release of neurotrophic molecules that promote neurogenesis and brain growth, and it is known to improve memory and stave off age-related cognitive decline. Our metabolic engines have evolved to accommodate increased activity as well. Humans’ maximum sustained power output, our VO2max, is at least four times greater than that of chimpanzees. But the adaptations to exercise appear to go even deeper, accelerating the rate with which our cells function and burn calories. My work with Ross, Raichlen and others has shown that humans have evolved a faster metabolism, providing fuel for increased physical activity and the other energetically costly traits that set humans apart, including bigger brains. All of this evidence points toward a new way of thinking about physical activity. But exercise is not optional; it is essential, and weight loss is probably the one health benefit it largely fails to deliver. Our bodies are evolved to require daily physical activity, and consequently exercise does not make our bodies work more so much as it makes them work better. Recent advances in metabolomics have shown that exercising muscles release hundreds of signaling molecules into the body, and we are only beginning to learn the full extent of their physiological reach. Endurance exercise reduces chronic inflammation, a serious risk factor for cardiovascular disease. It lowers resting levels of the steroid hormones testosterone, estrogen and progesterone, which helps account for the reduced rate of reproductive cancers among adults who exercise regularly. Exercise may blunt the morning rise in cortisol, the stress hormone. It is known to reduce insulin insensitivity, the immediate mechanism behind type 2 diabetes, and helps to shuttle glucose into muscle glycogen stores instead of fat. Regular exercise improves the effectiveness of our immune system to stave off infection, especially as we age. Even light activity, such as standing instead of sitting, causes muscles to produce enzymes that help to clear fat from circulating blood." As I've often noted, the modern lifestyle (financial stress and a crushing commute/workload) and built environment often conspire against regular exercise. The trick is to make exercise a habit as regular as brushing one's teeth (assuming this is a regular behavior...). How to manage that is highly individualistic; the activity/exercise must be enjoyable enough that it doesn't take a massive application of willpower to make it happen. J.F. MD: "In-hospital exercise avoids deterioration in patients aged 75 - 101 - this challenges the idea that hospitalized patients should be on rest. This is not rehab after hospitalization - it is exercise while patients are acutely ill, in the hospital. Excerpt of the research abstract: A moderately challenging exercise program may help elderly patients avoid some of the deterioration associated with acute hospitalization, the authors of a new study write. In a randomized clinical trial of patients ranging in age from 75 to 101 years, an individualized, multicomponent program consisting of resistance, balance, walking, and gait retraining exercises was associated with significant improvements in functional and cognitive status compared with usual care, Nicolás Martinez-Velilla, MD, PhD, and colleagues explain in an article published online November 12 in JAMA Internal Medicine. The traditional model of hospital care for elderly patients, which emphasizes bed rest, is often associated with significant functional decline even after the initial clinical problem has resolved. J.F. MD: The control group, who were treated without exercise, left the hospital less functional than when they came in. The exercise group left the hospital MORE functional than when they were admitted. Also, they had zero adverse effects from exercise, which I found interesting." 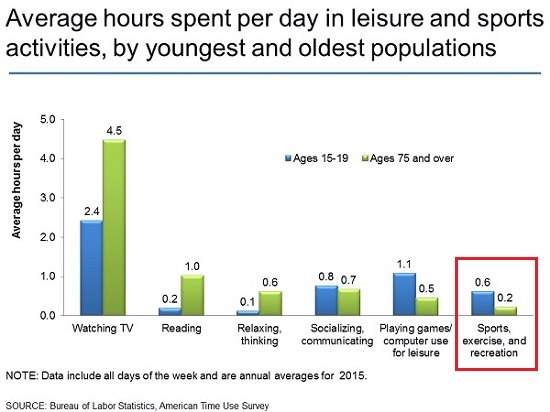 This chart from the Bureau of Labor Statistics (BLS) reflects the dominance of staring at screens in our leisure time. I suspect it grossly under-estimates the total time spent being physically inactive as a result of smart phones. Thank you, James D. ($50), for your sumptuously generous contribution to this site -- I am greatly honored by your support and readership. Thank you, Leslie G. ($5/month), for your splendidly generous subscription to this site -- I am greatly honored by your support and readership. Apple has always been equally an enterprise and a secular religion. The Apple Faithful do not tolerate heretics or critics, and non-believers "just don't get it." So the first thing any critic must do is establish their credentials as a Believer:My first Mac model 0001 was the 21,447th made in week 32 of 1984 in Fremont, California. Now that we've established that, we can move on to my profound sense of anguished abandonment that Apple ceased producing the iPhone SE, the only form factor that works for me. But Apple Faithful are accustomed to repeated bouts of anguished abandonment; it's just one of the burdens the faithful must bear. Focusing on the enterprise rather than the religion, Apple's core--its revenue and profit potential--is rotten. As the charts below illustrate, despite all the happy talk about growing "services," the hardware-software iPhone generates nearly 60% of Apple's revenues. 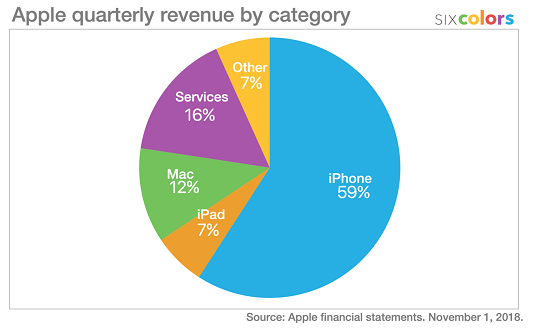 The iPhone ecosystem is also the foundation of the "services" currently being hyped as replacement sources of revenue. 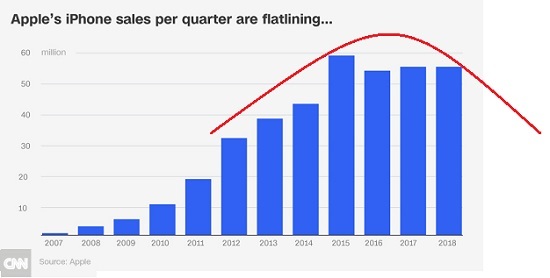 As the second chart illustrates, the market for costly mobile phones is saturated: everyone on the planet who could afford one and wants one has already bought one. 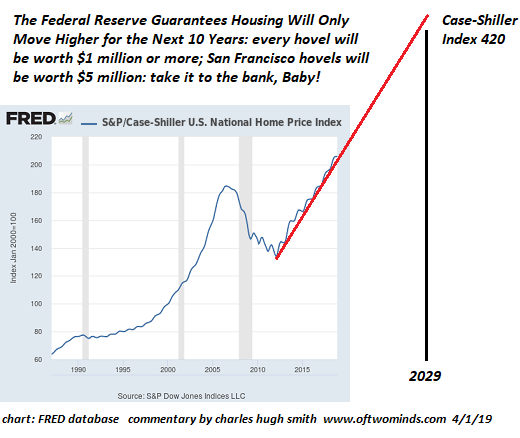 As we all know, the "fix" for saturation is to speed up the product cycle so the existing owners are forced to buy a newer and much more costly model every year or two. 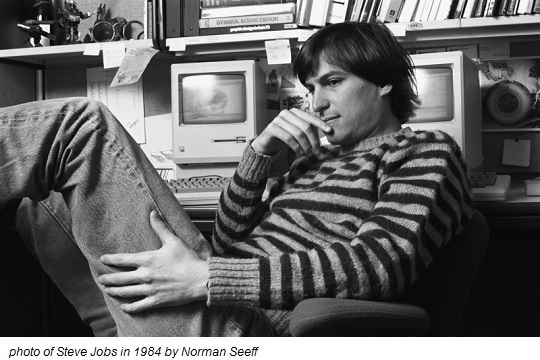 Then there's the other problem: without Steve Jobs, there is no "next big thing" at Apple. As I've explained many times here and in my books, value flows to scarcity, and Apple's enormous profits are based on the artificial scarcity Apple has been able to impose on the market by closely guarding its proprietary mix of hardware and software. The innovations of late-cycle iPhones are out of synch with the price increases.Apple is moving from selling innovations worth an extra couple hundred dollars to resting on its status-symbol laurels as a "luxury brand." That may work well in a global expansion, i.e. 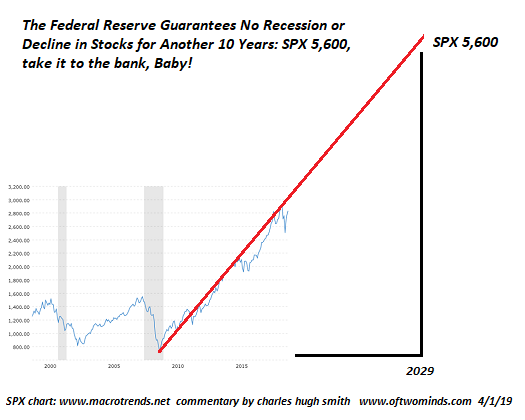 the past 10 years, but as the world economy contracts (don't dare call it recession), that strategy will not yield the same results it did in the expansionary cycle. Lastly, the "services" Apple is entering are commoditized and extremely competitive, markets in which it has very little proprietary territory to defend.Payment systems and credit cards are commoditized markets: there is very little differentiating the options and the host of competitors is expanding rapidly. Many competitors are well-funded and experienced in maintaining customer loyalty. Payment systems and credit cards aren't a sideline as they are for Apple; these are the banks' bread and butter and they will not make it easy for Apple to carve off a proprietary territory. As I've also noted, commoditized products and services have low profit margins.Apple generated its tens of billions of dollars in profits by reaping extraordinary margins; those margins cannot be transferred to commoditized services. What happens to Apple's "growth story" once iPhone sales decline and the much-hyped services generate a mere trickle of net profit? Apple is facing a secular decline in its proprietary flagship that generated huge profit margins. 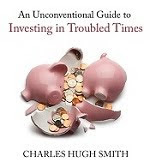 Entering commoditized, fiercely competitive low-margin services cannot substitute for the high-margin profits that will be lost as global recession and saturation erode iPhone sales. Thank you, Marty N. ($5/month), for your monstrously generous pledge to this site -- I am greatly honored by your steadfast support and readership. Thank you, Steve H. ($5/month), for your splendidly generous pledge to this site -- I am greatly honored by your steadfast support and readership. This pool of available wealth and income is so vast, we're assured, that taxing the super-wealthy will not really dent their wealth or the economy as a whole. 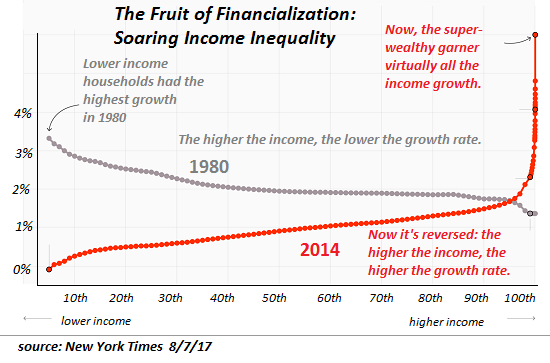 But what if the world is rapidly becoming poorer in every important sense?What if the decline in the standard of living of the bottom 90% of households that I've often addressed is not simply the result of the top 10% taking a greater share of the output (gains), but of the entire pie shrinking? I believe the steady decline of the purchasing power of labor--the source of most households' income--is not just the result of way income is distributed, but of a steadily diminishing pool of real-world wealth. We must start any discussion of total wealth/income by asking: what are we measuring with currencies such as dollars? What's not being measured? 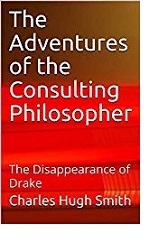 But as I've explained in my books, markets only price goods and services in the here and now. They lack mechanisms to measure the lifecycle costs of the goods, the degradation of wild fisheries, the loss of soil fertility (depletion), the opportunity cost of what could have been done with money squandered on consumption, and so on. The decline of fresh water tables and the shrinkage of glaciers that feed fresh water rivers don't make it into "price discovery" of markets. As a result, the expansion of "money" creates an illusion of rising wealth when in fact the natural capital we depend on is declining rapidly. But since we don't measure this in "price," it's ignored. If we combine the loss of purchasing power of labor with the tremendous loss of natural capital/wealth, it becomes self-evident that adding a zero to financial "wealth" hasn't made us actually wealthier in terms of what we can buy with our labor and what resources are still available to us for future "growth." A second assumption of UBI/redistribution proponents is that robotics and artificial intelligence (AI) will greatly increase humanity's wealth by replacing human labor at a fraction of the cost. This assumption is made so easily and often, it's easy to overlook that the claims never seem to originate from those actually manufacturing robots--a very capital and resource-intensive enterprise, and labor-intensive once maintenance and repair are added in. Take the simple example of a Roomba robot vacuum. The presumption is this labor saving device will replace human labor. But since I don't pay myself to clean my own house, there is no reduction in labor costs; there is only an additional consumption of resources and capital. As a Chinese economist recently observed, there is really only one very profitable Chinese corporation: Huawei. "The profits earned by 1,444 listed companies on the SME board and growth enterprise board are not even equal to one and half times the profit of the Industrial and Commercial Bank of China." But if we know anything about the push to self-driving cars, we know the competition in fierce and global, and all the necessary parts--sensors, artificial vision software, etc.-- are rapidly being commoditized. The truth is these services are not inherently profitable: the cost of operating a very complex vehicle will never be near-zero, and neither will the liability. Many other transport options will always be available to customers, starting with walking, public transport, biking, arranging a ride with a friend and the "black market" ride-sharing that will inevitably arise to cut out Uber's share of the fee. There is an exception, of course: people will pay more for status. People pay inordinate sums for an Apple phone because it has intangible but oh-so coveted status. But there is no equivalent in the vast majority of commoditized sectors. Very few people will pay extra for an Uber ride based on the company's brand. What unique and highly coveted status is associated with Uber or Lyft? The answer is none, just as it is for digital memory, mobile phone cameras and thousands of other commoditized technologies. Apple has status because it protects its proprietary integration of software and hardware which make it difficult to commoditize. But Android and cheap components are chipping away at the functional advantages of Apple's proprietary offerings. There is only one Apple globally. 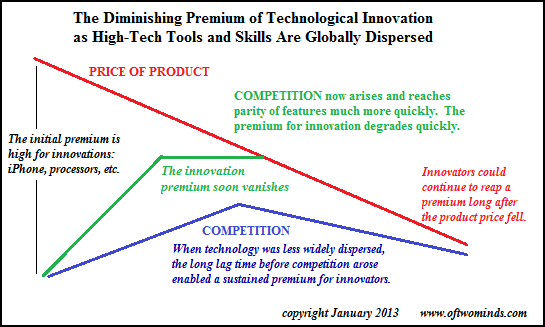 Very few enterprises escape the commoditization of their business, and these generally have high barriers to entry. Semiconductor fabrication plants cost upwards of $2 billion each; that's a high barrier of entry to a highly volatile and uncertain market. Few companies are willing to gamble the $2 billion in a field already crowded with competitors. 1. The problem is we have based our entire civilization on "growth," the never-ending expansion of consumption of resources, energy and capital, the the permanent expansion of everything: jobs, consumers, credit and so on. Robotics and AI simply add to the planet's burden. They don't reduce it. Robots are intrinsically energy and resource-intensive, capital-intensive and complex. Every robot is one product cycle or one component failure away from being just another piece of industrial junk bound for the landfill or perhaps the recycling yard--but there's no guarantee the robot will be disposed of properly, either, as recycling complex manufactured goods is intrinsically costly. AI software code may be "free" but the system to manifest AI in the real world is enormously resource and capital intensive: the cost of manufacturing chips is non-trivial, and power-hungry processors require huge amounts of energy to operate and replace. 2. Just as the high cost and complexity of robotics and AI is intrinsic, there is nothing intrinsically profitable about either robotics or AI. Merely replacing human labor doesn't automatically generate vast profits for decades; competitors will also eliminate their human labor. The more capital intensive the business, the more marginal the role of labor in the production process. Replacing human labor only generates profits until competitors eliminate their laborers, or until new technology obsoletes the entire business model. 3. The planet's natural capital and buffers are being exploited and consumed at a rate that guarantees disruption of essentials such as grain and fresh water. 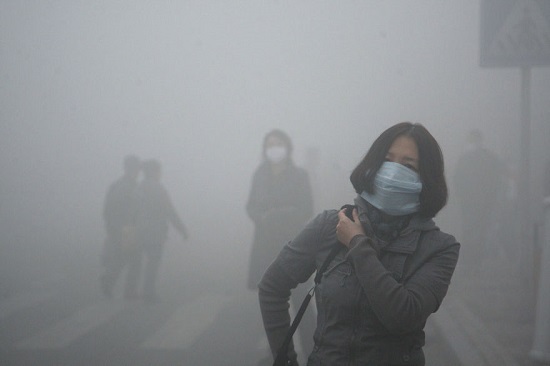 There are no cheap technological fixes to the depletion of natural capital. No robot or AI software can restore depleted soil or replace soil that washed away. 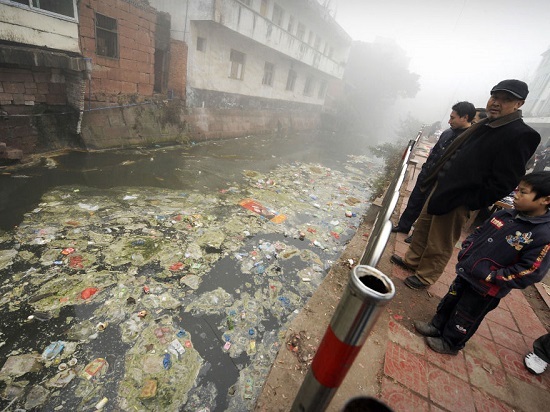 If we add in the loss of natural capital and the full lifecycle costs of our "growth"-dependent global system, we;re losing ground and becoming poorer by the day. Having central banks create more "money" can generate a phantom wealth for a short time, but as the saying has it, Nature Bats Last. Counting on phantom wealth to power an unsustainable system is delusional. We are adding knowledge and information to the pool of humanity's knowledge, but if we don't use that "wealth" to change the fundamental flaws in "growth" and a dependency on phantom wealth, we're still becoming poorer by the day. Thank you, Kevin K. ($50), for your monstrously generous contribution to this site -- I am greatly honored by your steadfast support and readership. Thank you, Jim G. ($40), for your splendidly generous contribution to this site -- I am greatly honored by your steadfast support and readership.